Well. On the list of things I’m supposed to be doing, blogging isn’t one of them. It’s the end-ish of August so academia is moving rather more slowly at the moment because my brain is tired and just wants to be creative. So to that end: a blog post which is a love letter to stories that have blown my mind. 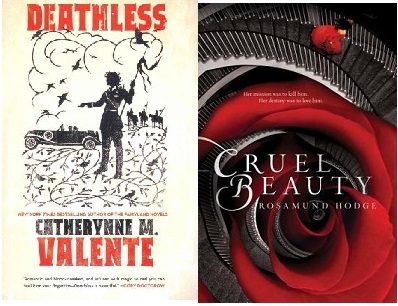 There are two books that spring to mind, both of which are recent discoveries (I’ll save my Tolkien love letter for another day, heh): Deathless by Catherynne Valente and Cruel Beauty by Rosamund Hodge. Deathless had me the moment I realized it was about Koschei the Deathless*. It’s twisted and dark and blood-streaked – and utterly ALIVE. And the prose is stunning and perfectly captures the Russian voice. Cruel Beauty drew me initially because of the cover** and the more I stared at it, the more I perused it, the more I was drawn into it. Anything that has echoes of Greek mythology, Beauty and the Beast (and a host of other fairy tales) and even Til We Have Faces*** by C.S. Lewis is my cup of tea. So I bought it and devoured it in a day. It’s dark and utterly exquisite. I’m rereading it now and as enamoured as ever. Again, beautiful prose. So what’s my point? My point is that a) both these books blew my fracking mind and you need to read them now, and b) I hit the end of both and thought I want to tell stories like that. The stories that sweep you up and take you places and leave you emotionally compromised even as you’re reaching for page 1 all over again. The stories that linger. The stories of love that are complicated yet never in doubt. These are the stories I want to tell. So when I’m tired and blech and it feels too much like work, I remember my dream. I remember why I’m doing this. And then everything makes sense all over again. *and if you don’t know who that is, hie thee to Wikipedia and educate thyself in the beauties of Russian folklore. **because let’s face it, it’s the cover that launched a thousand ships. Seriously. SERIOUSLY. ***And if you haven’t read Til We Have Faces you need to rethink your life. ‘Scuse me while I fill my wine glass in celebration. So. Yes. This is the second complete draft of the novel In Secret Kept. The entire second half has been rewritten because I stared at what I’d written originally and realized there was no way the characters would act that way. So I rewrote it. And one of my plot twists took a plot twist I DID. NOT. SEE. COMING. And I fought it. Which was my first clue that it was what was supposed to happen. Second clue was when the thing proceeded to map itself out for me. Third clue was when I woke up the next morning it was all still there despite the fact that I hadn’t written it down. Yeah. Ok. Neon sign. Gotcha. So I wrote. And now it’s finished. And now it has to sit and simmer for a few weeks while I attempt to distract myself with academia and other fiction writing. And when it’s been a few weeks, or a month, I’ll pull it out again and get to work. In the meantime, I’m gonna raise my glass of lovely French wine and give a Scottish toast, ’cause that’s how I roll.